Hollywood media reports suggest that the cinema box office is experiencing its worse attendance in twenty-five years and aside from a poor slate of summer films, you have to wonder how much streaming services are contributing to this downturn with their original movie offerings. 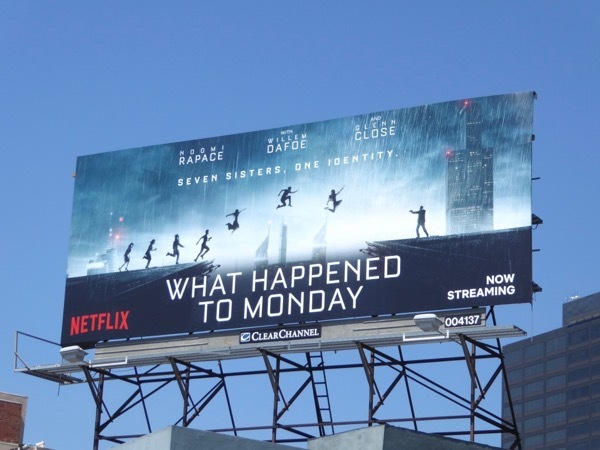 Netflix's latest film is offering subscribers a slice of sci-fi this summer, with What Happened to Monday. Set in a near feature where the world is faced with famine and overpopulation a strict one child policy is enforced, but seven sisters have a secret, they share one identity. Prometheus star Noomi Rapace stars as the Settman Septuplets each named after a different day of the week, each allowed to leave their apartment once a week as a common identity. 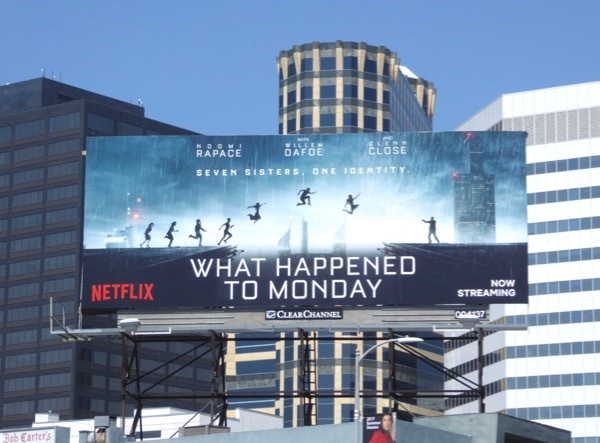 All goes to plan for the seven identical sisters until one day 'Monday' doesn't come home. 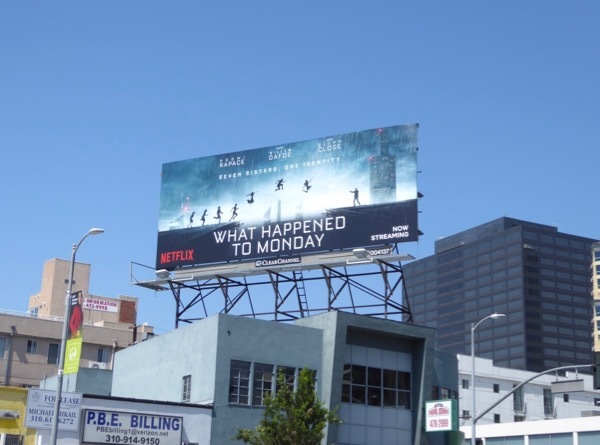 These dynamic Netflix film billboards were spotted high above Pico Boulevard and Westwood Boulevard on August 26, 2017. The action-packed ad creative for the movie almost has a 'March of Progress' feel to it and certainly screams science fiction. 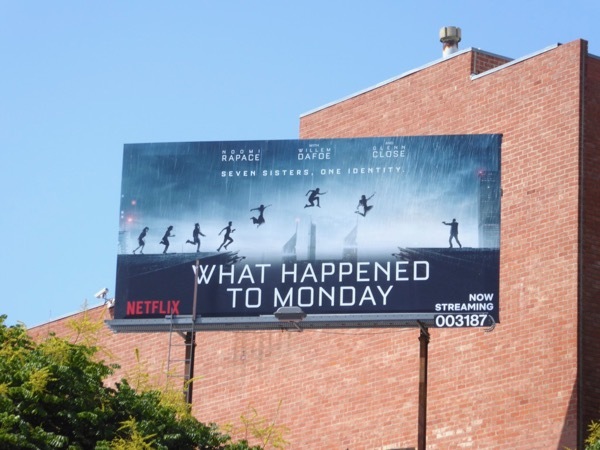 If you're looking for more movies to watch, maybe all these other Netflix film billboards will provide some entertainment inspiration. 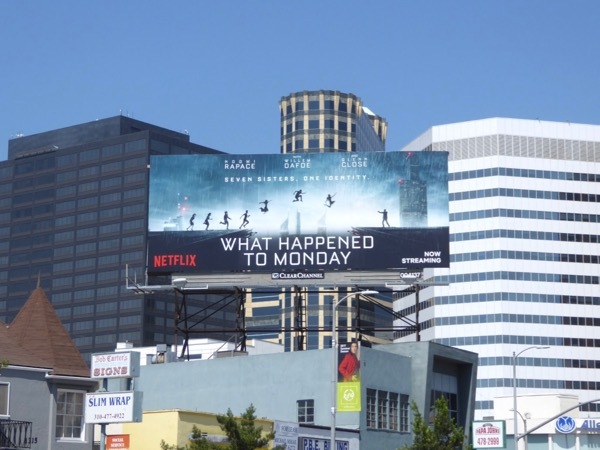 Hopefully at the end of this Labor Day holiday you'll have had some fun and won't be thinking What Happened to Monday?